Everybody knows that graphics should never trump gameplay, but attractive visuals certainly don't hurt a game's appeal. Of course, attractive doesn't necessarily mean photo-realistic. Classics like The Legend of Zelda: Wind Waker are highly-stylized, and aren't particularly demanding performance wise. Despite this, players still praise the game's art style to this day. It's a great example of a unique aesthetic standing the test of time. Google understands the importance of unique art styles if one of its latest announcements is anything to go by. 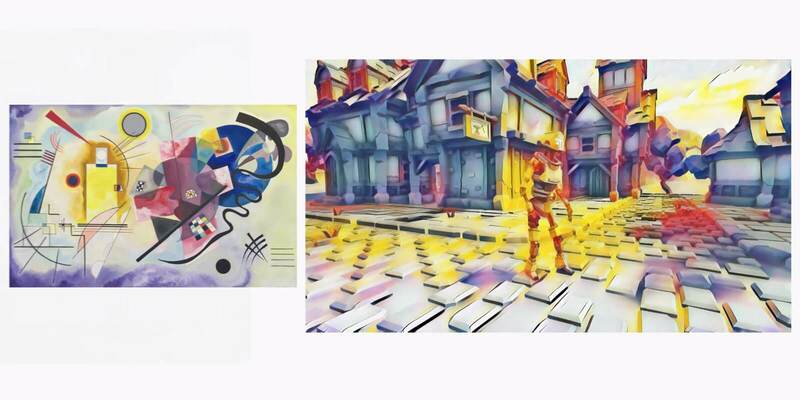 During its full Stadia game streaming service reveal keynote, Google teased "Style Transfer," a machine learning-based tool that will let developers have a bit more fun with their games' visuals. So, how does it work? To start with, a developer needs to feed Style Transfer's AI an image -- such as Vincent van Gogh's Starry Night -- and then the AI will automatically convert that image into a playable art style for a game. As players wander around said game's world, textures will seamlessly change on the fly to match the image's colors and objects. At first, this may seem like a silly project without any practical applications, but its potential could extend far beyond that if the tech matures. Perhaps giving Style Transfer an image of a few medieval buildings would be enough to create textures for an entire town - imagine how much easier an environmental artist's job would be if that were possible. At any rate, you can see Style Transfer in action via the video above. If it doesn't take you directly to the appropriate section, skip to about 55:12. Once you've seen it, let us know what you think of the idea in the comments below.